Port Barton, a small fishing village sheltered along Palawan’s west coast, is perfect for those who seek a quiet and secluded vacation in paradise. There are no forms of luxury in this sleepy village and only a few basic grocery stores and small restaurants. There are no cash machines, no fancy hotels or resorts, no banks and electricity stops around midnight. Still, many tourists appreciate the beautiful surroundings and the basic setting of this village only serve to enhance the experience. Our tour package includes accommodation, transportation and tours of your choice. Port Barton is easily accessible from Puerto Princesa, and usually serves as a stopping point along the way to El Nido. We recommend spending between 2 and 3 nights there, before heading to the more touristy El Nido. Read below to find out how to incorporate Port Barton into your overall Palawan itinerary as a single day tour or an overnight package. It is possible to visit Port Barton as a single day tour going out of Puerto Princesa. You can read below and see what activities are the most popular there, and choose the one you like most. We will take care of transportation, and help you visit this beautiful place without needing to spend the night there. You can also do a full day there before continuing on your way to El Nido. These options are perfect for those who are a bit weary of the basic accommodation. While families with small kids might opt for the day tour option, we highly encourage everyone to spend at least a night or 2 in Port Barton. 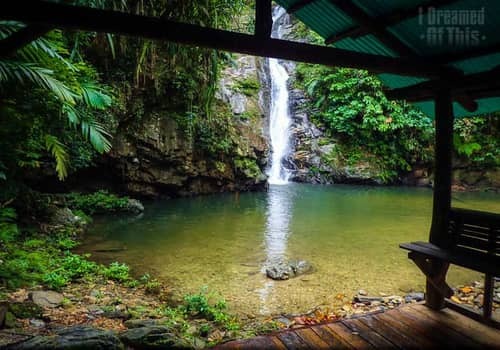 This place is not only very beautiful and unique, but it also provides a refreshing respite from the other crowded spots in Palawan. This is the perfect place to catch your breath for a few days before heading to El Nido, which is undoubtedly beautiful but also very touristic. Most accommodations in Port Barton are found strewn along the 1.3 km beach of Itaytay. It is the main settlement in the area where transport vehicles start and end their trips, where restaurants (or eateries) are and most of the commercial trades are happening. Expect to pay at least 30% less on all accommodations in Port Barton compared to the 3 main tourist destinations in Palawan (Puerto Princesa, El Nido and Coron). Here, you can easily find basic inns or homestays with no air-conditioning for as low as 500 Pesos per night. Since most of the hotels are small, you cannot find them in travel websites. Although it doesn’t really get crowded in Port Barton, it is still advised to book ahead during peak season (November to May) due to the fact that during holidays, some accommodations close down and the ones that do remain open tend to get fully-booked. Camping is also popular if you prefer to stay close to nature. You can camp in one of the 8 islands or just along the beach in the village. Flights : The San Vicente Airport is now open so going to Port Barton directly from Clark airport is possible. Philippine Airlines offers daily flights to San Vicente. Boat : Port Barton is a port so if you will be coming from El NIdo or San Vicente Poblacion (town proper) you have the option to go by boat. From San Vicente, boat ride will take 45 minutes. From El Nido, it will take 5 hours. 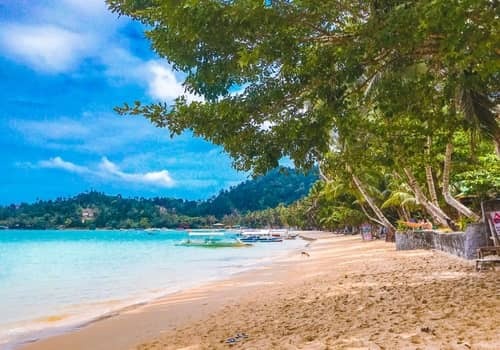 Best time to visit : Peak Season is from November to May (dry season) but most of the tourists are from Europe (yes, very few local tourists in Port Barton) so it is busiest during December to February. Extra tips : Cash only for all transactions. No cash machines and no banks in Port Barton. Electricity is limited. From 5:30pm (as of this writing) til 12 midnight, but most of the resorts we work with have a generator. There are several ways to get to Port Barton. From San Vicente Airport, the quickest way to get there is by boat. Travel time is 45 minutes. If you choose to travel by land, it will take you 2-3 hours. If you will be coming from Puerto Princesa, you need to go to the San Jose Terminal from the airport. There are several buses, jeepneys and vans that you can hire at the terminal going to Port Barton. Travel time is between 3-4 hours and fare starts at 250 pesos. There is only one bus per day and it leaves at 9am. . Your best chance is going by van and you can book it through us in advance – we offer both group vans and private rides. If you will be coming from El Nido, there is no direct road connecting El Nido to Port Barton so you can take a boat from El Nido to the port directly. Travel time is 5 hours and the views are majestic. By road, you will have to go to Roxas from El Nido and from Roxas, you need to take a jeepney going to Port Barton. There is only one jeepney per day and travel time is 2 hours. Port Barton is not like El Nido or Coron where you can do a lot of fun different activities each day. The village is small and there is really not much to do except laze around the beach and swim. It is really a place for relaxing. Nevertheless, there are still a few attractions in the area but it mainly involves island-hopping and nature-tripping. There are no parties, no bars to hop into and no fancy restaurants for food trips. There are about 8 islands in Port Barton and some of them offer great snorkelling opportunities. It is best to start as early as possible when the waters are still calm. You can ask your boatman to prepare lunch for you on one of the islands and lunch usually includes grilled seafood, salad, fruits and buko (coconut) juice. Full day of island-hopping and snorkelling lasts up to 7 hours and includes at least 4 different locations. Prices vary depending on the inclusions and the number of people but it starts anywhere from 1200 to 3000 pesos per boat. Make sure to bring your own snorkelling gear otherwise you might struggle to find one. Here is a list of islands and reefs typically included in the island-hopping tours. Note that tours may only include some but not all of the islands mentioned below. For specific requests, please let our agents know in advance. Exotic Island: This is a beautiful island with white sandy beach and aquamarine waters. It is excellent for swimming, camping and lunch. Exotic Island has 2 islets and the waters between them are shallow. Snorkelling is possible but not really that great. You will have to swim out to a bigger area to actually find nice spots with healthy corals and fish. Paradise Island: Paradise Island is privately owned so there is an entrance fee to pay. The reefs were heavily damaged by bleaching but the conservation efforts are now starting to pay off as corals start to grow back. There are many large fan corals and schools of fish on the island. Aquarium: Just like in an aquarium, the corals here are colorful and teeming with life. The shallowest bit is 2 meters and there is no land around the reef. It is advised to be extremely careful where the boat will be anchored. German Island (Inaladelan Island): Perhaps the most popular island in Port Barton, Inaladelan was previously owned by a German hence the name but the new owners changed it back to its original name. The island itself is beautiful, surrounded with coconut trees and white sand. The turquoise-blue water is very good for swimming. It is also a popular camping ground for tourists who stay the night. Double Island: This Island has got some really nice snorkelling spots. Nearby reefs include: small lagoon, and fantastic reef with beautiful green corals and schools of fish. Secret Paradise Resort and Turtle Sanctuary: Guests of the resort can access the 77-hectare nature reserve and its 4 beaches. The resort takes pride in being the only turtle sanctuary in the country recommended by the World Wildlife Fund Philippines. Some of the turtles found in the sanctuary are: hawksbill, Olive-Ridley (they lay their eggs on the island from Oct-Mar – turtle season) and green sea turtles. Twin Rocks and Manta Ray Reef: Used to be very beautiful spots but dynamite fishing and ocean bleaching has damaged most of the corals. The reefs are slowly recovering and in Manta Ray reef, the area of 150 hectares is the largest coral area in San Vicente. Mangrove Tour: The tour takes about 2 hours round-trip. It is best to actually rent a kayak and do it yourself but renting a small boat is also doable as it can go to shallow and narrow parts of the river. The sights are nice and interesting in some parts. Scuba Diving in Port Barton and San Vicente: There are very few dive resorts in Port Barton. There are currently 11 dive sites in Port Barton and 3 wreck sites. The best wreck site for diving is the trawler site which sits 25-35 meters below the surface and is teeming with marine life. Waterfalls Tours: There are 2 waterfalls in Port Barton. One is Papuwyan waterfall which is an easy 1.5 hour trek from the village. The slopes going to Papuwyan are gentle and easy and you’ll have to walk in shallow streams in some parts. The trail is difficult to follow though and not clearly stated so it is best to have a guide with you. The other waterfall is Bigaho which is a much better waterfall considering the larger catch basin for swimming. To get to Bigaho, you’ll have to ride a boat from Port Barton and travel time takes 20 minutes. From Bigaho center, it is a 1km easy trek and the last 100 meters are stone steps leading to the pool. Long beach: It is a 14km stretch of nice beach found in San Vicente and not in Port Barton. It can be arranged as a day tour from Port Barton. Long Beach is the longest stretch of sand in all of Palawan. How does Port Barton fit into your Travel Plans? Port Barton is not for everybody. If you like parties and bars or if you are fuzzy about modern conveniences, Port Barton is not for you. But if you truly desire some real peace and quiet, there is nowhere else in Palawan that is as peaceful and as beautiful as Port Barton. El Nido and Coron are both stunning but they are full of tourists and it can get really busy. So if you like a breath of fresh air and to just get away from it all, Port Barton is your place to be. Stopping for a few nights in Port Barton is highly recommended for those of you who have more than a week to spend in Palawan. Guests on shorter stays might be better off skipping this location and focusing on the more popular spots in Palawan. Still, if you have the time for it, this is a great option to diversify your extended holiday in Palawan. Port Barton is easily accessible from Puerto Princesa. We can help you get there and we will incorporate Port Barton into your overall Palawan trip so you can maximize your time in the province and enjoy a good mix of everything it has to offer. We will ensure that you will have easy and comfortable transfers and find you the best accommodation for your budget. If you do choose to include Port Barton in your Palawan tour package, you’ll realize that it is an amazing contrast to the more touristic spots such as El Nido and Puerto Princesa.